Book Buddies is a youth literacy program for children from Kindergarten to Second Grade and will be held at the Stillwater Library. Guest readers, Buddies, may be members of the Teen Advisory Board or other community volunteers. A librarian will supervise the program. 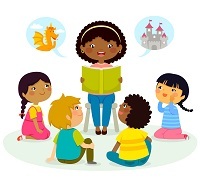 Following about 20 minutes where the buddy will read aloud to attendees, there will be a short discussion and a craft or activity that ties into the book. This is a new program series happening on the 3rd Monday each month. Parents and caregivers are expected to remain in the building but attendance at the program is not required. No registration is required.